Today we'll be taking a look on the Rheobus from Sunbeam. I've got the second version of this Rheobus with a silver aluminum faceplate and some super bright blue/red bi-color LEDs. The Rheobus arrived a few weeks ago in this nice looking retail package. In it I found the Rheobus, a Molex Y-cable, 6 screws and the instructions which were a little outdated. 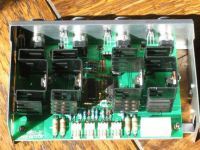 The instructions tell you how you need to assemble the Rheobus, and howto connect fans to the 4 pairs of spring-loaded terminals. The newer version that I received and which is sold in most shops is pre-assembled and has four 3-pin fan connectors. 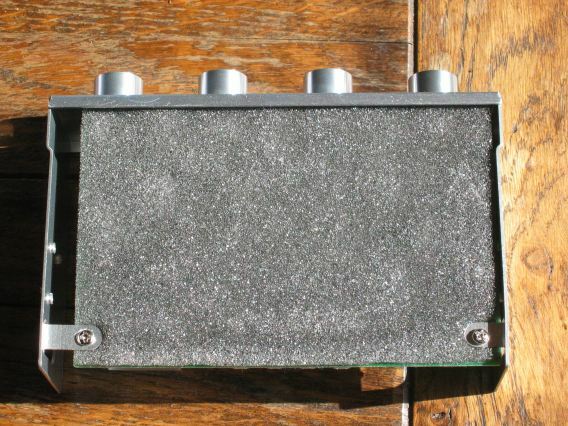 Here he is the Rheobus! It fits in a 5.25" drive bay and it has a shiny silver aluminum front, a version with a black aluminum front panel is also avaible. 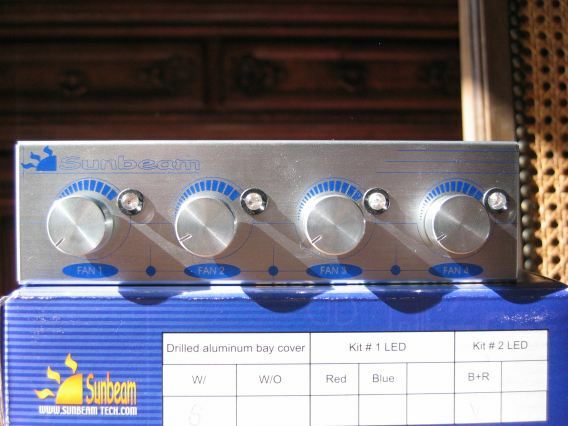 It has 4 aluminum knobs and it has some blue text and graphics printed on it like you can see on the picture. 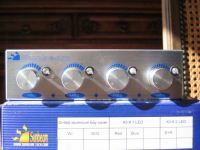 WOW 20W per channel! That's a lot if you know that most 80mm fans only draw around 1.5W. The higher performance 80mm fans however like the Vantec Tornado draw 9.1W. 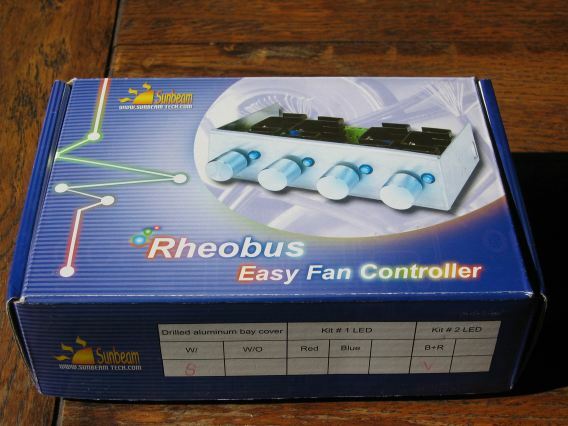 So theoretically with this Rheobus you should be able to connect up to 2 of those per channel, and even more 'normal' fans. 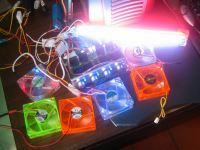 You can also use the Rheobus for other stuff than fans, like Cold Cathodes. The Cold Cathodes from Sunbeam draw about 2.85W so you should be able to connect up to 6 per channel of the Rheobus. And if this still isn't enough you still have 3 other channels to put some load on. 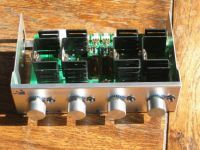 However I would not recomment only using 1 channel of the Rheobus, I think it's the best to spread the load over the 4 channels of the Rheobus. 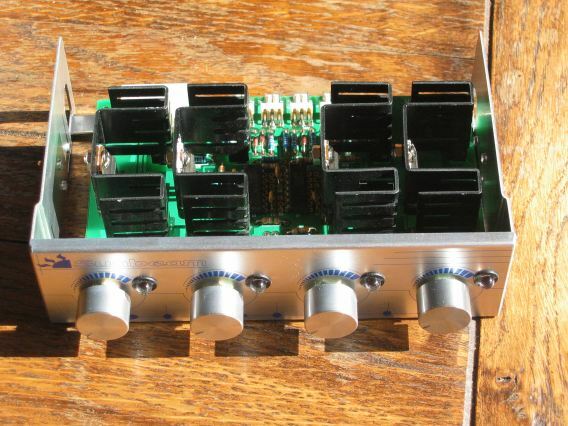 Also I would not load all four channels fully up to 20W (combined this makes 80W!) unless you have a very good PSU. 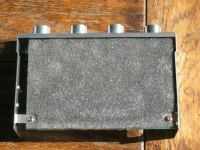 Here you have another look on the Rheobus from Sunbeam. 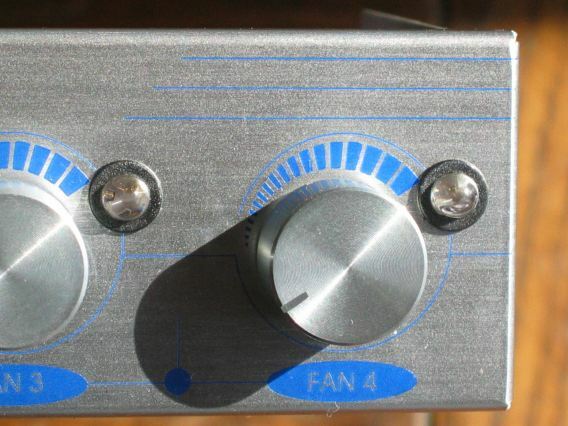 On the second picture you can see one of the aluminum knobs to adjust the voltages of the channels. A very nice feature of this Rheobus is the ability to turn an individual channel off, turn them whole to the left and you'll hear a click! This is the first Rheobus that I've seen that has this feature. Right of the knob you have the bi-color superbright LED. 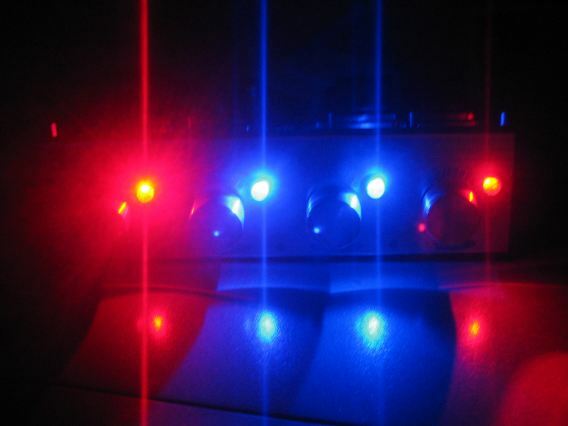 The LED has a red color when you turn on the channel, above 7V the color changes to blue. Another very nice feature is that these LEDs are socketed. 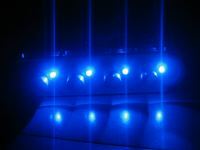 This means you can take them out very easely, and replace them with other LEDs, no need to solder anything just plug them in! 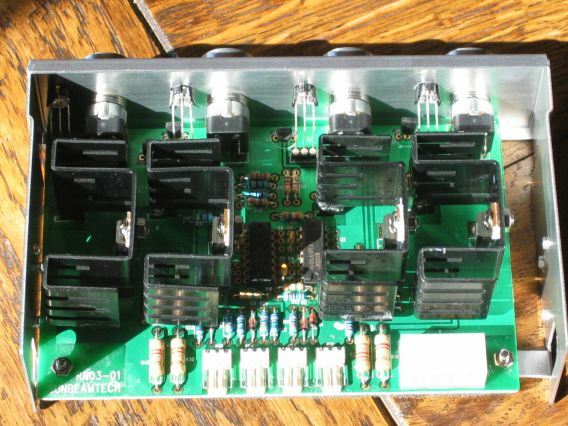 Also notice the four huge black heatsinks, they should be able to cool down the rheostats without any problem I guess. 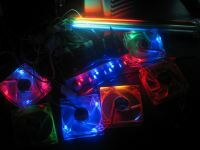 I've tested this by running 3 cold cathodes and a LED fan on channel four on the lowest voltage on which they were still all working (this generates the most heat) for an houre. The heatsink normally were only 0.5°C to 1°C above the average roomtemperature of 21°C, after running them for an houre on the lowest possible voltage on which all connected devices were still working the heatsinks were 32°C, and the rheostats were 35°C hot. No need to worry because this almost won't raise your case temperature. On the lowest voltage most devices wont be working anymore by the way, most fans and other devices only start working on 7V and higher. On the thirth picture you have a closer look on the 3-pin connectors. One for each channel of this Rheobus. 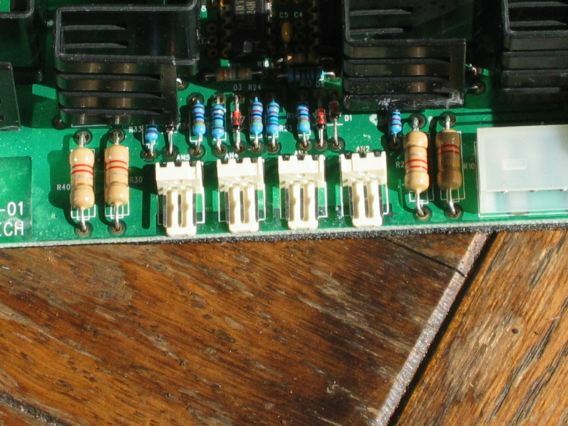 For some users 3-pin connectors or very fine, but most users will have a lot of 4-pin fans or lighting devices so I feel that they could have included four 3 to 4-pin connectors with the Rheobus. That's the only thing I'm missing with this Rheobus. Safety above everything they thought and they gave the underside of the PCB a foam pad to protect this unit agaist accidental short circuiting with other devices in your computer. 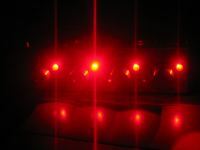 On the first pic all LEDs are red so all channels were under 7V. 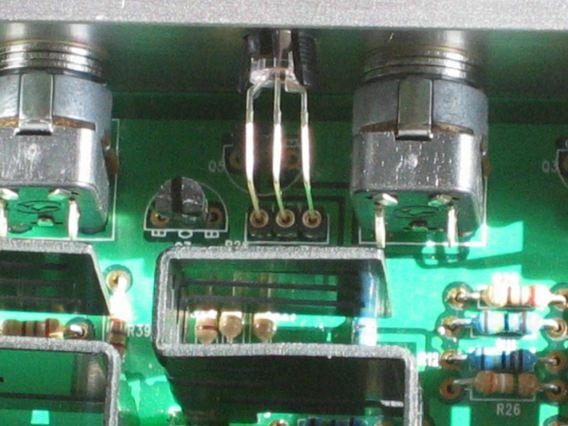 On the second picture the second and third channel were above 7V, those LEDs turned blue when they reached beyond 7V. On the third picture all channels went above 7V and they all turned blue. The LEDs are one of the only bad things about this Rheobus, they are very bright, too bright for me because when I look right to them they just blind me! Three Cold Cathodes and six fans, I've let all those running for a few houres and it didn't gave me any problems. And yes even Cold Cathodes and other lighting devices can be controlled with this Rheobus! 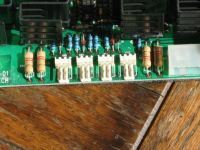 You do need a 3-pin connector but some Cold Cathodes already have these, and Sunbeam also started supplying these because there was a demand for it. 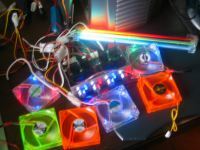 Another solution is to connect a Molex connector from the Cold Cathode to a fan with both 3-pin and 4-pin connectors together with the Molex passtrough connector which was included with the Rheobus. This way you can connect 4-pin Molex connecter devices to the Rheobus. Thumbs up again for Sunbeam! Again they brought us a fantastic working product. 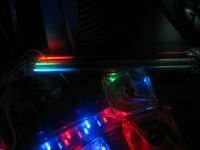 It has some nice and cool features like the bi-color LEDs, the massive heatsinks to cool down the Rheobus, the ability to connect other devices to it like Cold Cathodes and ofcourse the ability to turn fans off! Overall this is a very nice product which is surely able to reduce the noise in your system generated by fans! 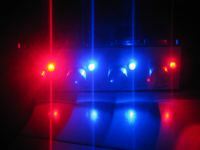 The only thing I don't like are the super-bright-blinding LEDs. 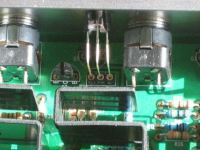 * Keven : we already included two 4-4 pin connector and one 3-2 pin connector for inverter & CCFL. So, user can not only adjust the fan speed but also the brightness of CCFL.